The Standing on Sacred Ground series has inspired a new alliance between Hawaiian leaders and those in California, Papua New Guinea, Borneo, Ecuador, Colombia, Kenya, Mongolia and the Altai Republic. The Sacred Land Film Project, Altai Project and Protect Kaho‘olawe ‘Ohana in partnership with Amazon Watch, Borneo Project, Gaia Foundation, Womens’ Earth and Climate Action Network organized a formidable delegation to participate in the IUCN World Conservation Congress in Hawai‘i, which met September 1-10. The congress represented a powerful opportunity for indigenous people to both challenge and contribute to the international conservation movement at a critical time in history. 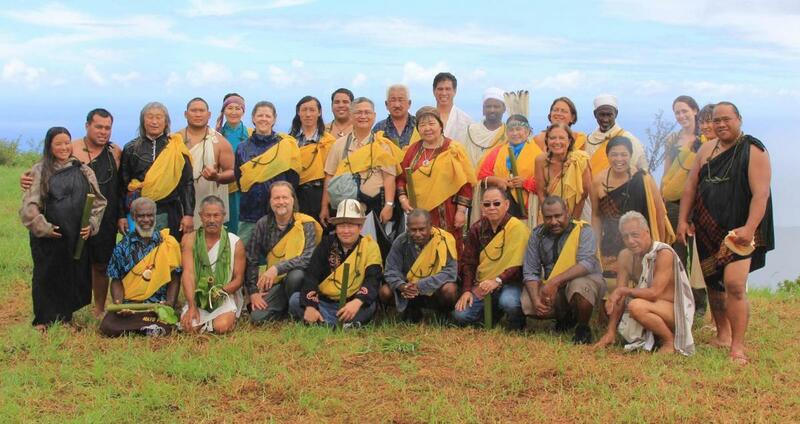 Assembling 25 indigenous leaders from around the world in Hawai‘i underlined the connection between native peoples and biodiversity in sacred cultural landscapes. As these leaders discussed success stories and tragic losses, as they conducted ceremony with Native Hawaiians, as they addressed conservation experts from around the world—we recorded their presentations and responses to questions, and will now edit short video clips to post on YouTube. This content will address the change in values needed to protect the earth, and the role of sacred natural sites in the protection of biodiversity. A key focus at the congress was declaring sacred natural sites and territories "No Go" Areas for mining and other extractive industries—and we succeeded with passage of the historic Motion 26. Working together in Hawai‘i cemented bonds between indigenous communities as they networked, shared information, and planned future activities. This alliance of guardians is an important strategy, politically and spiritually, in defense of the earth—and it represents a great public education opportunity. Follow our daily reports from Hawai'i and beyond on Facebook, Twitter: @SacredLandFilm, and Instagram: @SacredLandFilmProject. Breaking news! Passed: Motion 26 — "Protected areas and other areas important for biodiversity in relation to environmentally damaging industrial activities and infrastructure development"
MEDIA ADVISORY, 8/24/16 — "Historic Gathering of Indigenous Leaders Champion 'No Go' Areas For Sacred Sites at IUCN World Conservation Congress"
"Long Journey to a More Righteous Shore." Earth Island Journal, 9/27/16.